Hope everyone is having a great week! 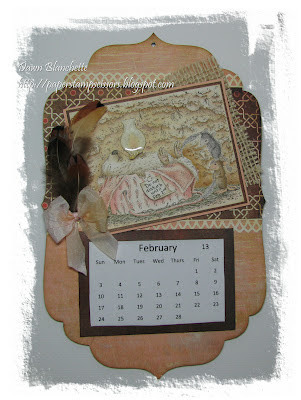 I have finally finished the February page for my mother's House Mouse calendar and what a learning experience it was! If you haven't already learned the hard way, let me tell you all about Timber brown Stazon ink. It doesn't really stay on very well. After colouring my image with Distress inks (which it does stay on for) I decided the little lantern needed to look like glass. So I applied Glossy Accents over it and to my complete horror, the brown ink bled! I almost cried! I didn't want to waste the image and the time it took to colour it, so I restamped the lantern onto another sheet and recoloured it so I could piece it back together. This time I applied Goosebumps thinking that it might be more compatible as it is the same brand. It wasn't. So, I stamped it again, this time with black and recoloured and used glossy accents. For some reason, the brown ink bleeds but the black does not. So, don't look too closely at the lantern as it is darker than the rest of the image and pieced together which just bothers me. Of course, I say that in vain as everyone is now examining the lantern with a magnifier. 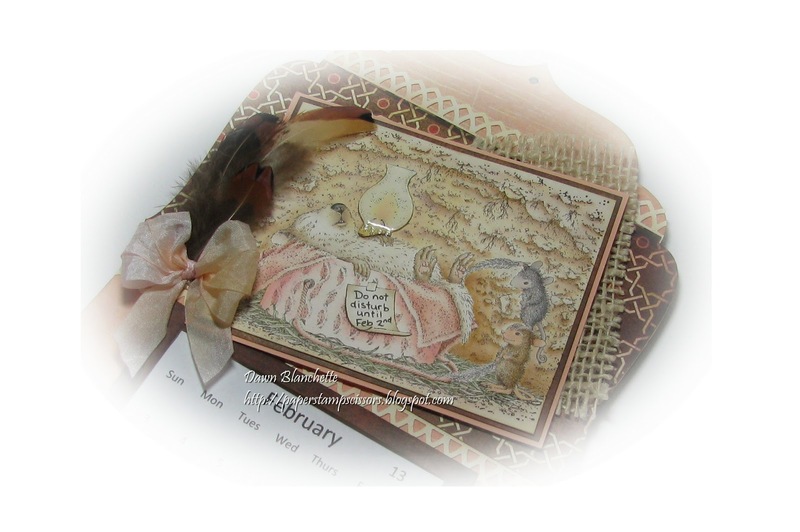 Other - feathers, seam binding ribbon dyed with tattered rose, glossy accents, burlap, calendar was computer generated and slides in the pocket so it can be changed each year. I'd like to enter this calendar page in the Totally Papercrafts Challenge - my favourite things (I have so many! Some of my favourites are House Mouse, ribbon and colouring with Distress inks) and I'm also linking up to the Make it Monday linky party. Thanks for stopping in and for taking the time to leave a comment! I love reading them and it gives me the chance to visit you to! Eeeek!It's heartbreaking when something goes wrong, isn't it? My usual is coffee spilt everywhere! Your calendar page is fantastic - i wouldn't know anything had gone wrong if you hadn't told!It's beautiful! Absolutely lovely Dawn! Thank you so much for joining us at MIM! Remember, to be in the running to win the prize from our sponsor this week just leave a comment for another entry. Be sure to mention you saw them on Make It Monday. The more entries you comment on the more chances you have of winning!